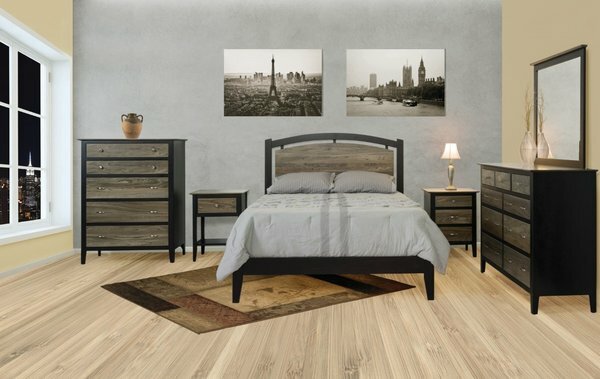 Add the Quick Ship Amish Berkeley Six Piece Bedroom Set to your bedroom and completely transform your suite. This handmade bedroom set is sold as shown in a combination of brown maple and elm wood in the finish combination of your choice. Included with this solid wood bedroom set is one bed in a queen or king size, one five drawer chest, one one drawer nightstand, one three drawer nightstand, and one nine drawer dresser with a matching mirror. There is a total of 18 drawers which are all assembled using dovetailed joinery. These dovetailed drawers are all attached to full extension ball bearing side mount drawer slides providing you complete access to the inside of the drawers for storage. Authentic Amish craftsmanship and solid wood construction are paired together to bring you a heirloom quality set. Get on the phone and call one of our friendly specialists today at our toll free number - 866-272-6773 if you have any questions or would like additional information for this Amish made bedroom set. Thank you for choosing DutchCrafters Amish Furniture for all of your bedroom furniture needs. Quality Takes Time – Typical Build Time for This Piece is 2 to 3 weeks.